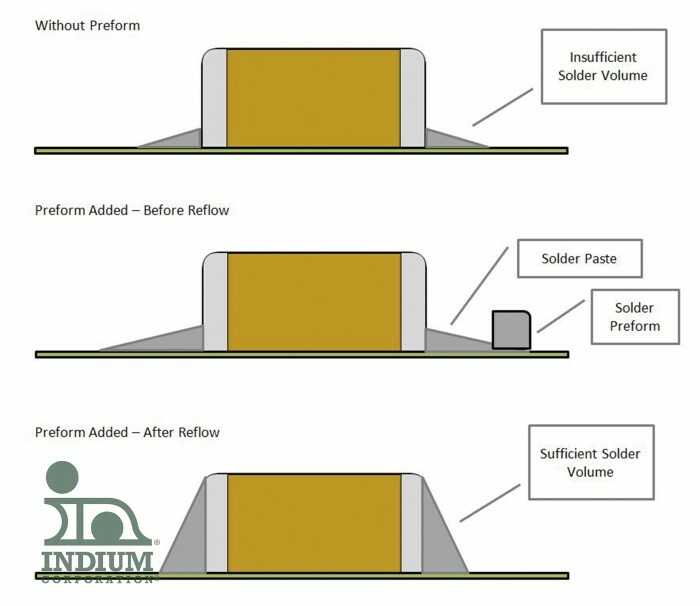 In past blog posts, I have talked about multiple applications for Indium Corporation’s Solder Fortification® Preforms where stronger solder joints are needed including edge connectors, through-hole connectors, QFN void reduction, and RF shielding. Today, we will add capacitors to that list. Capacitors are ‘a passive two-terminal electrical component that stores potential energy in an electric field’ typically soldered onto the component using solder paste; however, as is common with the other application-centric blog posts that I have written about Solder Fortification® Preforms, solder paste may not always provide a sufficient amount of solder to the joint, and in some applications it is preferred that the fillet reach the top of the capacitor. Solder Fortification® Preforms to the rescue! With the addition of the correct Solder Fortification Preform, a proper and desirable fillet shape can be achieved.